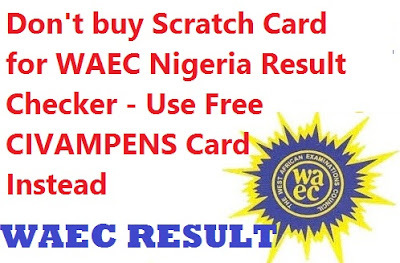 Free WAEC Scratch Card Number (Breaking News) - You Don’t Need to Buy Scratch Cards to Check 2017 WAEC Result. Our Latest updates on WAEC has revealed the simple Guidelines on How To Check the 2017 WAEC May/June Result Online without scratch card. Check WAEC 2017 Results Here with CIVAMPENS Card. In this article, we have revealed new method on how to check 2017 WAEC Result online with the CIVAMPENS Card – On Monday, we publish a new article "WAEC Releases Results for May/June 2017 - Check Your WASSCE Result Here" informing you and the rest of the general public that presently, the West Africa Examination Council, (WAEC) has released the Nigeria's 2017 May/June West African Senior School Certificate Examination (WASSCE) Results online. We also informed you that the releases was made known via WAEC official Twitter Account. On the other hand, we also informed all the future university students and WaEC candidates that participated in the 2017 West African Examinations Council (WAEC) May/June WASSCE session that they can now Login to WAEC Portal and check their results online using scratch card. EQUALLY IMPORTANT - The information above has been changed because WAEC has announced now that you can now Check Your WAEC Result Without Scratch Card. Furthermore, this is to say that, you do not ned to purchase a new scratch card to print out your result for this year. First and foremost, Login to WAEC Result Checking Portal at http://www.waecdirect.org. Secondly, now Enter your WAEC Examination Number in the required column. Meanwhile, Select your Examination Year i.e. 2017. Afterwords, Select your Examination Type i.e. SCHOOL CANDIDATE RESULT. More importantly, Enter the CIVAMPENS Card Serial Number. Above all, Enter the CIVAMPENS Card PIN. As a matter of fact, you don’t need to buy any scratch card to check your WAEC result. All things considered, the result checker PIN and Serial Number are contained on the flip side of the candidates’ CIVAMPENS Card issued to all candidates by WAEC before the commencement of the examination. However, Keep in mind that according to the statistics released by WAEC, 59.22%, obtained minimum of credits in five (5) subjects and above, including English Language and Mathematics. Moreover, some others failed because they cheated, while some results was seized/cancelled/without for examination malpractice offences. In conclusion, to stay updated, please subscribe your email in the box below. Finally, share this to Your Friends so that they don't waste their money to buy the WAEC Scratch card for WAEC Nigeria Result Checker.